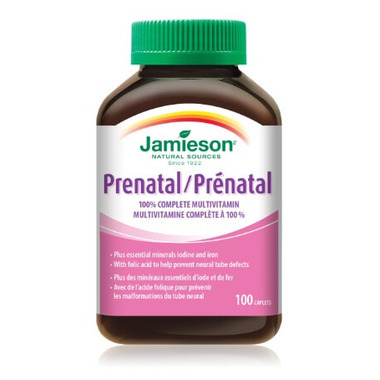 Jamieson Prenatal 100% Complete Multivitamin is a complete prenatal and postnatal multivitamin, rich in folic acid, to provide expecting and nursing mothers with the essential nutrients they need to support their baby’s healthy development and help prevent neural tube defects. Directions: Adult Women: Take 1 caplet daily with a meal prior to conception, during pregnancy, and while breastfeeding. Take a few hours before or after taking other medications. Store between 15°C and 25°C, away from children. Also Contains: Cellulose, water-soluble cellulose, hydroxypropyl cellulose, modified cellulose gum, vegetable stearic acid, vegetable magnesium stearate, silica, titanium dioxide, riboflavin, anthocyanins, carmine. Warning: There is enough drug (iron) in this package to seriously harm a child. Keep out of reach of children. Consult a health care practitioner prior to use if you are taking blood thinners.